Target is to control UC surface on Pc connected in FireWire to RM with DSP view from Tablet like a remote desktop to be able to have DSP view inside UC surface on Tablet. Run a Tablet with Windows OS that lets you install programs from anywhere and not just Windows App store. Install UC Surface, and you have your solution. Windows RT on older versions of Surface from Microsoft do not let you install your own applicaitons. Surface Pro 2 and newer models do. 3rd Party Tablets that run Windows 10 OS may also let you do this, make sure to do your research before buying. is there any way to get to the Smart Features of UC Surface Via my Android Tablet? Sound check with capture 2 and UC Surface only letting me adjust with the faders. No gain control or EQ. 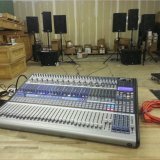 Will UC Surface operate with Mackie Control Universal Pro? Is there a way to get "Post fader per channel" in a StudioLive Series III mixer?